Everyone has at one time or another had it happen. Maybe you're sitting at a movie theater. Perhaps at a nice restaurant. Maybe you're in a pew at church. Then, there's that all too familiar pins and needles feeling in your foot, then it creeps up your leg. You try to shake it so that it wakes up. People start to give you weird looks. Some people smirk, others wink. You're unwittingly sending mixed messages. Your foot is asleep. Well finally, after years of painstaking research, Dr. Ivan Malcomb claims that sleeping feet actually dream. His project began as a simple question from a neighbor while they were playing scrabble and drinking a supposedly non-alcoholic beverage. "Linda said to me, 'Ivan, my foot's asleep. I hate when this happens. It's probably dreaming of comfortable but stylish shoes, or a stroll on a tropical beach somewhere no doubt. I mean right?' Of course, she was probably just being silly, but a lightning bolt struck my brain at that moment. I had an apostrophe...er...epiphany." For the next 5 years Dr. Malcomb invited people over to his house to play scrabble, trying myriad techniques to lull their feet into a deep sleep; a sleep he calls RTM. Rapid Toe Movement, similar to its cousin REM - Rapid Eye Movement - occurs when the foot has reached its dream state. "I tried to be really sedate and boring for 5 years. My wife told me I didn't have to try, but I did anyway. We sat around watching reruns of Mr. Rogers and Baywatch, and playing scrabble, hangman, and team solitaire. Yes, team solitaire," said Dr. Malcomb. Once a subject's foot entered RTM, he strapped electrodes along its "Neo-Pedal Cortex" on the arch of the foot, and measured the dream activity. After two years of mapping dream activity, Ivan found that he could accurately map the energy, and even what each foot was dreaming. Dr. Malcomb elaborated, "If the energy is concentrated in the ball of the foot with slow radiating impulses to the toes, the most likely dreams are of little piggies, pedicures, and weird foot-related toe-sucking nightmares. If the energy is along the main corridor of the Neo-Pedal Cortex, then the dreams are more intricate and tend to be about trendy shoe styles, glamor, or massages." While his research maybe controversial, and his methods unorthodox, Dr. Ivan Malcomb remains adamant that his conclusions are correct. "I stand by work one hundred percent. I think it will change the world and the way we think about feet, and sleep. My next study will be assessing dreams in other appendages like the arm, the leg, or the...I guess that's it." So even if you are bothered by your foot's narcolepsy, consider your foot. It might actually enjoy sleeping. 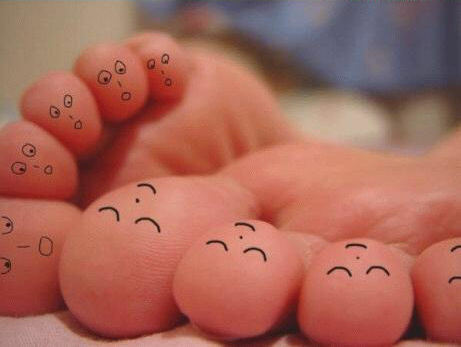 Instead of hitting your sleeping foot against a table leg on nervously stamping the floor, perhaps next time you should just rock back and forth gently, sing a sweet lullaby and give your foot a break.